Legian Beach Villas are nestled within the Legian Beach Hotel Premises sit as an oasis within bustling and vibrant environment of Legian, it is remarkable to discover the four hectares of gardens and parklands, which is the beautifully calming setting for Legian Beach Villas. The vast tropical gardens of 40,000 square metres are fringed by the colourful destination on three sides and the famed beachfront on the fourth. Bali’s international airport is approximately a 30-minute drive. This unequalled location and environment of tropical plantings and shade trees allows for spacious accommodations to suit every leisure lifestyle for the ultimate privacy within the spacious Premier Pool Villas, Deluxe Pool Villas and Deluxe Garden Villas – make it ideal for honeymooners and couples as well as family with young children. As a complete resort, there is a diverse offering of cuisine from five restaurants plus four bars, including a swim up pool bar to satisfy every palate from Indonesian, Regional, Asian and Western; from candlelight dinners to fabulous Balinese dance dinner shows and in-room dining. In addition to the many on-site activities, the inspired Usadha Spa offers therapeutic and rejuvenation concepts together with a menu of soothing massages and healing practices, you may never want to venture far from the premises. A comprehensive choice of on and off-site activities are on offer to enjoy and discover the extraordinary destination. Of course, lazing by your very own pool with a good book is another option! 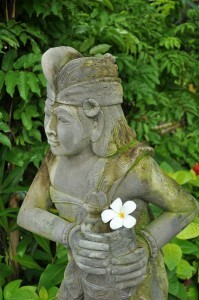 Legian is a Balinese word meaning pleasant and delightful to the senses. Your friendly hosts at Legian Beach Villas will do everything to ensure that your holiday is not only delightful, but also very special and memorable. Sustainable and eco-friendly certifications by Tri Hita Karana the Balinese concept of Balanced Life, and Travelife U.K. In the bustling, vibrant environment of Legian area, it is remarkable to discover the four hectares of gardens and parklands, which is the beautifully calming setting for Legian Beach Villas nestled within the premises of Legian Beach Hotel. This unequalled location and environment of tropical plantings and shade trees allows for spacious accommodations to suit every leisure lifestyle for the ultimate privacy within the spacious Deluxe Pool Villas – make it ideal for honeymooners and couples as well as family with young children. We understand your hesitancy in traveling to the island of Bali due to the uncertainty surrounding the activities of Mount Agung. However. we wish to assure you that Legian Beach Villas is well outside of 10 kilometers arround the mountain. In the event Mount Agung activities couse closure of the Ngurah Rain International Airport on your planned depature date (after minimum 3 nigths stay), we will be pleased to ofer an aditional up to 3 (three) night accommodation, including breakfast, free of charge. Any extention of stay beyond the 3 (three) free nights will be charged at a special discounted rate. We will aslo work closely with the local goverment authorities to assit with transfer to the nearest Indonesia Airport. In the event flights to and from Bali are suspended and you can not come to Bali, no cancellation fees will be charged. We sincerely appriciate your consideration, as we navigate the challenges of this unprecdictable situtation.